Actually, our wilderness is not so precious that we’d give up prosperity to keep a particular piece of it. That’s taking the principle too far. We can replace a piece of any old reserve with another piece somewhere else. There’s plenty of it. Look at a map. If part of our conservation estate is sitting on a fortune in gold, oil or any other material resource, who are we to restrict the flood of community riches it would bring to this and future generations? If land is damaged by mining activity, we’re perfectly capable of restoring it to good condition. Then all you do is wait a few decades, and like Mount St Helen’s in Washington laid waste by a tremendous eruption, nature itself completely restores the land and its plants and animals. One of the Greens’ most emotional arguments for “fighting” climate change is to stop costs falling on future generations. Think of the grandchildren, they wail. Now they want to stop the manna falling on future generations as well, the miserable sods. Russell Norman should think of the grandchildren now, but he recommends they get nothing that happens to lie beneath a native tree, happy to perhaps condemn them to a life of bare subsistence farming or fishing, like our stone-age ancestors. I trust he enjoys the good quality motor car we imported for his convenience and the imported aeroplanes we pay for him to travel on. He should know the money for that has to be earned using natural resources — there’s nothing else we can work with. Oh dear, oh dear! I’ve just found this page at the Ministry for Eco-terrorists. It displays the stark reality of how much land is already locked away from us. Four years ago (apparently it takes more than four years to find out what’s changed) 20% of the North Island was “legally protected” and a whopping 44% of the South Island was locked up. Where will it end? The inset map shows the amount of protected land added since 2006 — a spectacular 6.3% in just three years. The green and yellow areas make up 44% of the South Island. It’s good that we have such steep land to make reserves from, but we don’t need to cripple our ability to prosper or, at a minimum, we should know precisely what resources we might be locking up. And, you know, talk about it, decide together. Shut up, Russell. The word “Crown” appears on the MfE web page just once: at the bottom, in the phrase “Crown copyright 1998-2013”. The bureaucrats running the MfE eschew the antiquated and class-ridden notion of the “Crown” so it’s been replaced by “conservation estate”, “legally protected” and other expressions to obscure the fact that we’re living in a parliamentary monarchy. After 30 years of this, young people will be surprised to learn the British sovereign has not in fact been removed as head of state. They will be by then entirely unfamiliar with our proud heritage in language, law and political systems and will quietly and obediently finish the job of republicanising the nation without a fuss. But I digress. They prefer parks over prosperity — without compromise, puritanical and grim. 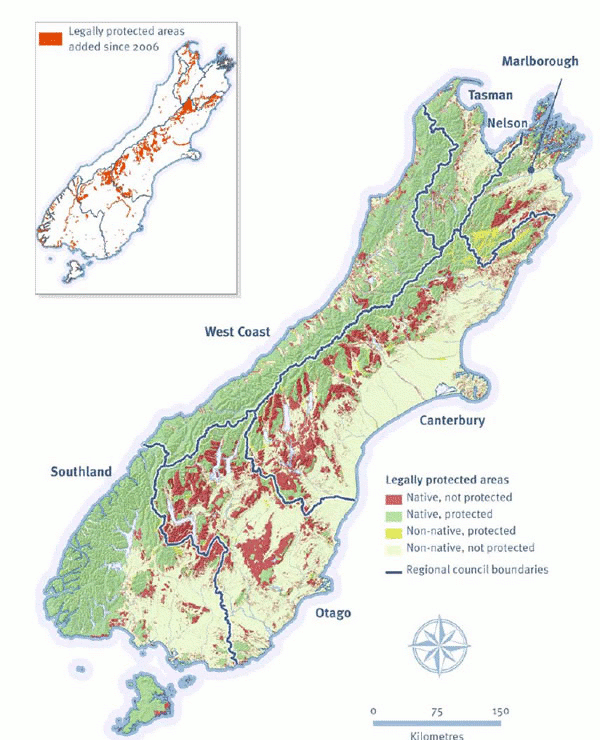 “The red, green and yellow areas make up 44% of the South Island.” Red is native, not protected. Yes, it is. Sorry, I was muddling it with the inset graph. Thanks, Mike. It’s still a heck of a lot of land. The South Island covers 150,437 square kilometres, so 44% is over 66,000 square kilometres. There’s a lot of gold in them thar hills. In my view, the title is bang on. The Green value system appears to place Man at the bottom of the pile and untouched Nature at the top. I suspect (and hope) their dystopian views will eventually make them so unpopular that any party that panders to their ridiculous notions will render itself unelectable. Like the founder of Greenpeace (who had to walk away from his creation when it became a perversion of his founding ideal) I believe we need to take proper care of our environment and that includes using proper plant and animal husbandry techniques, rather than a blanket ban on making sensible use of natural resources for Man’s betterment. I find the idea of blasting the tops off mountains to get at the coal underneath, as is done in the USA, to be equally as unacceptable as simply locking away vast tracts of land so none of the natural resources can be harvested for fear of ‘disturbing nature’ .